My favorite measuring spoon set. 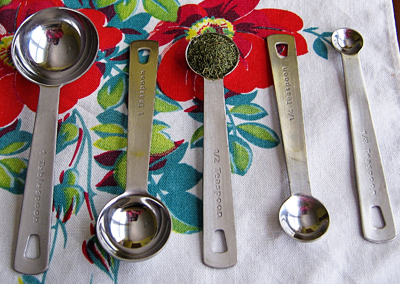 Measuring spoons are used to measure both dry ingredients and wet ingredients. Shown above is my favorite stainless steel set that I bought from Williams Sonoma a few years back. They have a reflective, polished finish and have really kept the shine even after several washings. * Measuring spoons are usually plastic, melamine, or metal. 1 teaspoon, 1/2 teaspoon, 1/4 teaspoon and 1/8 teaspoon. You can also buy additional odd-measure spoons that come in 2 teaspoons, 1 1/2 tablespoons and 2 tablespoon sizes. Always use the appropriate size spoon that is asked for in the recipe. * Measure liquids by filling the spoon full to the top. * Measure dry ingredients by filling the spoon and then leveling off the top with the straight-edge of a kitchen knife. Sugar- More than just for sugar cookies!